Our Nicole table is an oval-shaped 6-seater table and features detailed metalwork including lattice patterning and a central floral motif. This table set is the smallest of our oval woven lattice design tables (see also Summer and Victoria), it allows space for up to 6 people and will fit on a wide range of patios and lawns. Our Nicole outdoor dining table weighs only 29 kg and is made of high-quality sand-cast aluminium which means it can be easily moved around the garden when required but doesn’t have to be stored away or covered throughout winter. Enjoy al fresco dining at its best with the Nicole table. 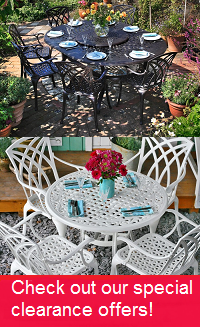 There is high demand for the Nicole table & 6 chair set in timeless Antique Bronze, but why not try our alternative colour, the Nicole in White, to help brighten things up in your garden. You could even save yourself a few pounds as we often have some great deals on these stunning alternative colours. Don't forget to look at our gifts section above where we offer amazing discounts of 30-70% on a wide range of products to complement your purchase of the Nicole table set. First Class service. Very pleased with product. Easy to assemble. Happy family. Everthing went fine and quickly! The furniture are lovely!!! Very good service, like the ability to choose a "bundle" ie different chair styles, a discounted bistro set etc. Quality furniture, simple to put together - although a ratchet spanner is a must, would have taken ages with the little spanners included. Impressed with the company and love my furniture, well done Lazy Susan. Customer service very good. Furniture attractive. I found the table & chairs not terribly sturdy. We had three pièces that had to be re-delivered due to faults. Again efficient response and overall quite happy. The service when ordering over the phone was prompt, polite and to the point. The furniture was delivered on time as previously agreed, was well packaged and complete except for a few screw fittings that were supplied by post the next day. Assembly instructions are a little sparse, but sufficient for a reasonably intelligent adult to work with, especially if that person had any furniture or mechanical assembly experience (e.g. building IKEA furniture, simple car mechanics). 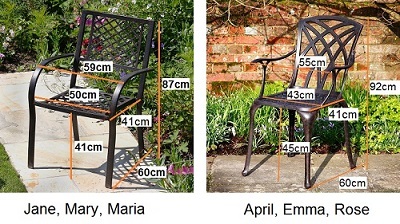 Build quality of the castings is very good, however some of the chair arms had geometries that were a little off, requiring some significant bolt tightening to achieve a smooth fit where the arm meets the back and seat of the chair. I also found that some of the blind bolts hadn't been properly tightened into their bolt holes, however this is easily rectified with a stout screwdriver. Several of the components had small areas where the paint had flaked and bright aluminium could be seen. This is not a big issue, and on request, a paint touch up kit was provided, a small bottle of undercoat and top coat each was delivered by post the following day. 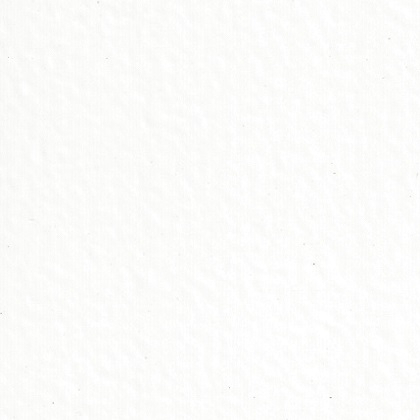 My request for this issue to be dealt with was met with polite concern and speedy resolution: no fuss, no bother! Fully assembled, the table and chairs are robust, comfortable and look fabulous! I would recommend this product and not hesitate to make further purchases from Lazy Susan! Excellent service, I made a mistake with the cushion colour, phoned customer services and the error was corrected very easily and efficiently. The table and chairs are excellent quality and look really smart. I would recommend to anyone.